ReSharper C++ 2018.3 has had literally every smart feature in it tuned, making them work more precisely on modern C++ code. It takes care about every single detail and specifier in refactorings, code navigation, and code analysis. The formatter is much easier to set up now, and significant improvements are provided for C++/CLI and Unreal Engine code bases. ReSharper C++ 2018.3 offers several notable performance improvements. First, Find code issues and InspectCode command line tool are now parallelized, which makes them significantly faster. Second, Cache loading on project reopening is now parallel as well, which makes it twice as fast on average. Finally, there are general performance improvements in code completion, initial project indexing, and file analysis. Start working with your Unreal Engine 4 projects in mere seconds! When opening a solution, ReSharper C++ only parses non-engine projects, while the engine files are indexed in the background later. This means you can start typing or navigating through your project seconds after you open it! Unreal Engine uses specific macros (UCLASS, USTRUCT, UENUM, etc.) to emulate missing reflection features in C++. 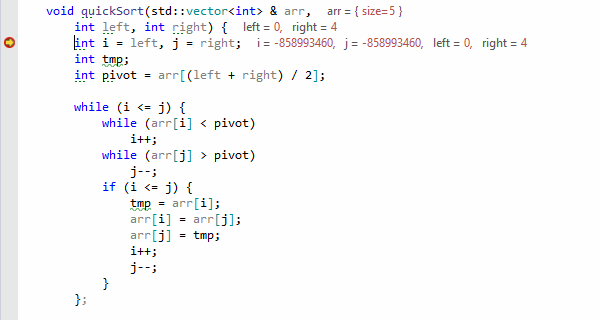 These macros are now parsed by ReSharper C++ correctly, even before you build your Unreal Engine project. When the overload resolution fails in C++, ReSharper C++ 2018.3 now provides a more specific description of the cause, identifying the exact requirements that aren’t satisfied. This is especially helpful for failed enable_if conditions, ill-formed expressions inside decltype, and absent inner types. 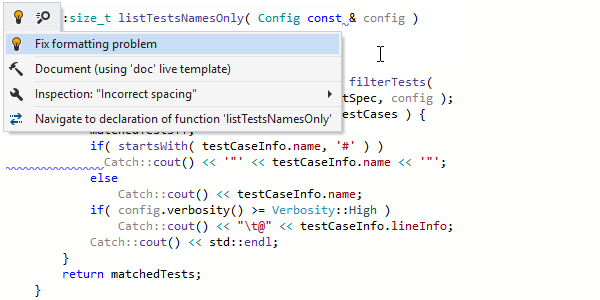 If that wasn't enough, completion now uses default template arguments to provide suggestions in dependent code. The Parameter Info popup shows even more information such as deleted functions, implicitly generated functions, and template parameter descriptions taken from documentation comments for template arguments. Parameter Info also works for dependent code and for user-defined binary operators. To finish things off, it’s now colored and more readable. C++ name hints in function calls and aggregate initialization can help you find your way through long (and sometimes nested) lists of parameters. You may also find useful the new name hints at the end of namespace definitions, right after the closing brace. More than 10 new inspections were added, many of them with matching quick-fixes to resolve the detected problems. For example, now there's a quick-fix you can use to add a functional-style cast and initialize all uninitialized members/bases. Meanwhile, integration with Clang-tidy was updated to Clang 7, bringing 50+ additional checks. ReSharper's refactorings are now more knowledgeable about modern C++. When you use the Change Signature refactoring, you can now choose to make a function constexpr, const, or noexcept, as well as change the ref-qualifiers. 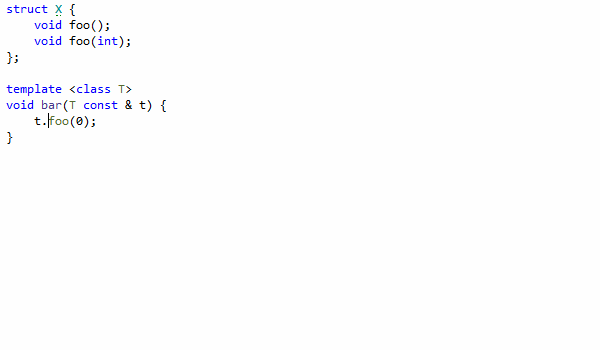 Generate a function implementation and copy it to the clipboard instead of inserting it into the document. Generate a function that converts an enum to a string (customizable via a live template). Convert a regular return type in a function declaration into a trailing return type, and vice versa. Insert template arguments deduced using class template argument deduction. Go to declaration now works on non-dependent decltype specifiers and lambdas (going to the lambda body). It even works during the initial project indexing, saving you even more time! Search Everywhere, a universal search action, has added some additional filters. For example, /gf for global C++ functions, /gv for global C++ variables, or /d for macro definitions. The handiest feature, however, has to be navigating to unmatched signatures. For example, when Go to declaration is called on a changed declaration of a member function, it goes to its definition with an old signature. ReSharper C++ can't auto-detect C++ naming schemes for now, but predefined C++ naming styles were added to the settings: STL, Google, LLVM, CamelCase, and Microsoft. 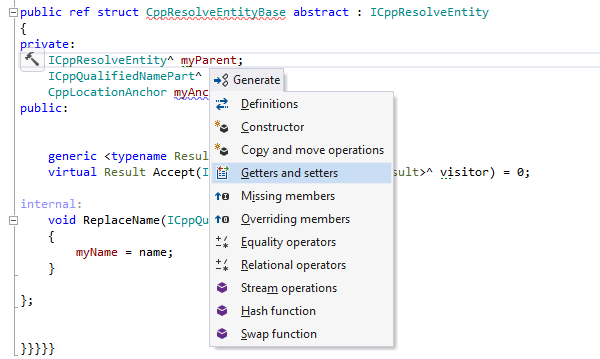 Select it in ReSharper Options | Code Editing | C++ | Naming Style. This release also provides support for Catch 2.5 and its new templated tests. C++/CLI is a set of C++ language extensions by Microsoft for easy interoperability between managed and native code. With extensive support for both managed languages and C++, it is only natural for ReSharper to offer help with writing code in C++/CLI too. However, with so many syntactic additions and peculiar changes to the C++ language semantics, handling C++/CLI is no easy task. But now the wait is over — ReSharper C++ 2018.2 makes C++/CLI support public, with many major features (including code inspections, typing assistance, formatting, and code completion) updated to support this language dialect. Please remember that we are still working on improving C++/CLI support, and cross-language navigation and refactorings are a work in progress. As we move to expand our coverage we would love to hear your feedback on what is missing and what you feel we should concentrate on. C++/CLI support requires a ReSharper Ultimate subscription and the ReSharper product to be enabled. 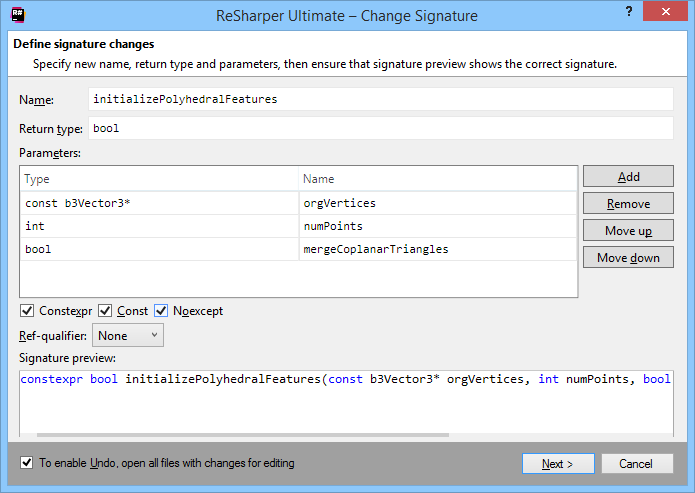 To learn more, see C++/CLI support comes to ReSharper C++. Class template argument deduction and user-defined deduction guides. Pack expansions in using declarations. Using declarations with multiple declarators. All in all, these updates mean that most of the major C++17 features are now supported by ReSharper C++, with the two biggest omissions being hexadecimal floating point literals and noexcept as a part of the function type. Coroutines (as specified in the n4760 Coroutines TS draft). Range-based for statements with initializer. ReSharper C++ 2018.2 provides spell-checking functionality out of the box, thanks to the newly bundled ReSpeller extension which has also been updated to support the C++ language. Just like with code analysis, ReSpeller scans for spelling mistakes and typos in identifiers, comments, and string literals, and provides quick-fixes to resolve these problems. When you encounter a spelling mistake, you can invoke the Alt+Enter menu and ReSpeller will provide several options to fix the problem: we can either fix the typo or add this word to ReSpeller's dictionary. By default, the spell checker comes with a built-in dictionary for English (United States), but dictionaries for other languages can be easily added too. For instructions on adding a new dictionary and more info about ReSpeller, see Integrated spell checking with ReSpeller in ReSharper and Rider. Every now and then, you want to be notified directly in the code when you are not following formatting rules. 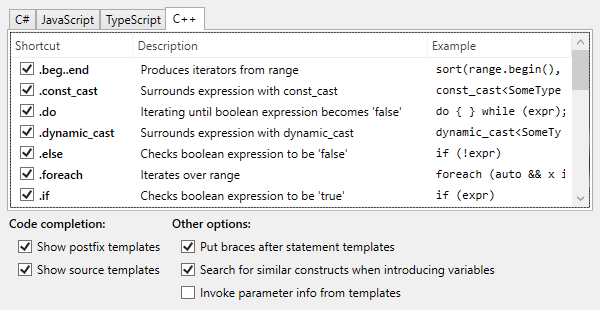 With this in mind, ReSharper's code formatting engine introduces inspections and quick-fixes for formatter-related problems: inconsistent indenting, line breaks, spaces, and blank lines can now be observed and fixed directly in the code editor. By default, formatting inspections are disabled so as not to bother anyone who doesn't care about formatting during typing. Go to ReSharper | Options | Code Inspection | Inspection Severity | C++ | Formatting to see all the available inspections and select severity levels for those of them that you wish to be notified of. To learn more, see Maintaining consistent code style with formatting inspections. When performing size and alignment calculations, the code analysis engine takes into account bit-field sizes, alignas specifiers, and __decltype(align) attributes. Parameter Info provides details about members of the aggregate class when performing aggregate initialization. Comments in a code file to override formatter settings can be generated directly from the Configure Format dialog. Range-based for statements provide references over the colon for easy navigation to the begin() and end() functions used by the loop. Separate color settings for static class fields and static member functions were added. Expected failures specification is supported in Boost.Test unit tests. A lot of performance fixes in different areas of ReSharper were made, from speeding up ClangFormat support to decreasing solution loading time. 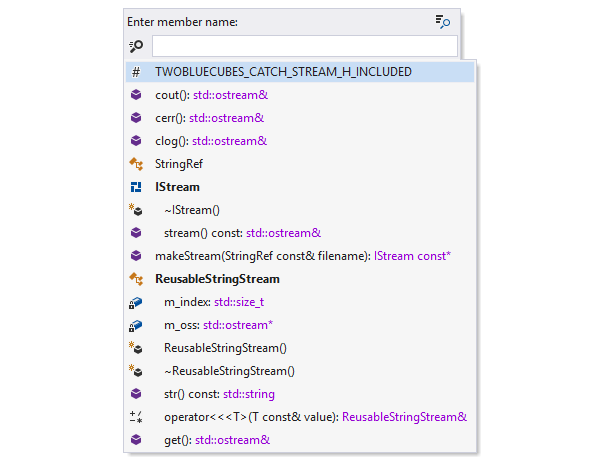 More detailed information is available in the performance blog post series dedicated to the ReSharper 2018.2 release. 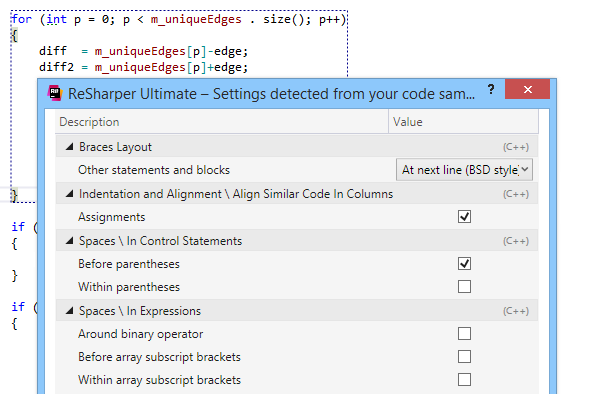 Step Filters is the latest addition to the host of features provided by ReSharper C++ for debugging. When you invoke Step Into, the Visual Studio debugger will normally step into all the functions that are called from the current statement. However, some of the functions are either trivial or so well tested, that you don’t want to step into them. This is where Step Filters comes in: with this feature you can specify functions that should always be stepped over by the debugger. You can inspect, configure, disable or enable back step filters on the Tools | Debugging | C++ options page, which has a list of all the available step filters. When you step into a function and decide that you want to step over it in the future, you can use a context action to quickly add this function to the list of step filters. For template functions, there are separate context actions to add either only the current instantiation of the function or all its instantiations. 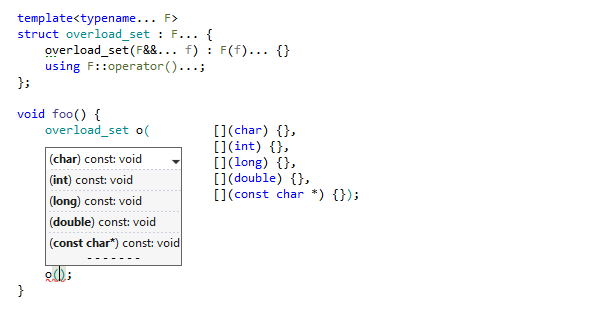 To learn more, see Step Filters in ReSharper C++. Compilation times are one of the biggest problems in large real-world C++ projects. ReSharper C++ 2018.1 introduces the Includes Analyzer, a new code inspection tool which helps you gauge which header files in your project contribute the most in terms of lines of code to the total compilation workload. To use it, invoke one of the ReSharper | Inspect | Analyze Includes in … actions or select Analyze Includes from the context menu in the Solution Explorer. 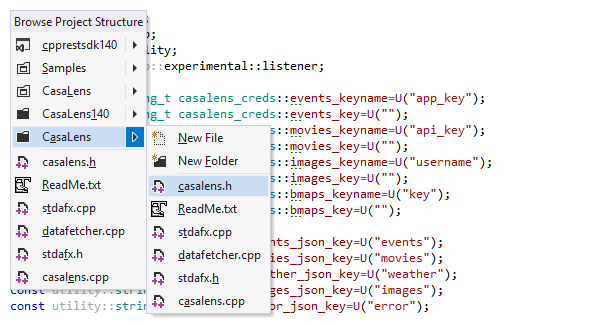 ReSharper C++ will analyze the files in the given scope and give a report in a dedicated tool window. The report lists files sorted by the number of lines of code they contribute together with their transitively included files. You can then dig into dependencies between the files either with the Includees tree view where child nodes correspond to the files that include the file in the parent node, or the Includers tree view where child nodes are the included files. Using these two views, you should be able to pinpoint the header files that contribute the most and then try to get rid of any unnecessary #include directives. The Go to File Member dialog has been redesigned. Class members are now grouped by their containing class in the results list. Moreover, with no search, active file members are sorted in the order of their declarations, and the scrolling list with the results accommodates more items. Together these changes improve the usability of the dialog by providing clearer insight into the structure of the current file. In all Go to dialogs and several other places ReSharper C++ now attempts to shorten symbol names that are excessively long by cutting out the function and template parameters. When you perform a search using the Recent Files dialog, Go to File search results are also appended to the results list after the Recent File items. ReSharper Command Line Tools, a free standalone collection of tools that can be used from the command line or as a part of the continuous integration process, now lets you perform code cleanup in C++ projects. 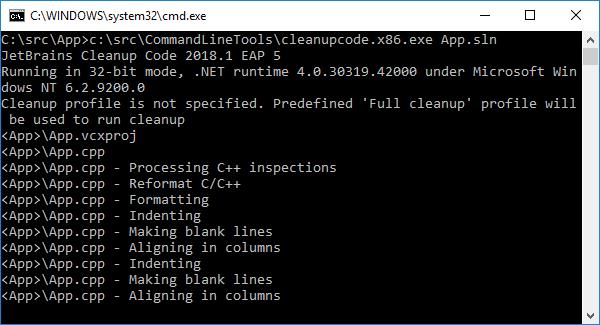 Run cleanupcode.x86.exe on your solution, and it will automatically reformat your code, remove common redundancies, apply Clang-Tidy fix-its and common code style fixes. This instantly eliminates code style violations in a project or a solution, and ensures a uniform code base. In related news, bogus errors which were output by the InspectCode tool on x64 projects were fixed in this release. In addition, TeamCity 2018.1 is able to run InspectCode on C++ projects (see TW-48978 for details). 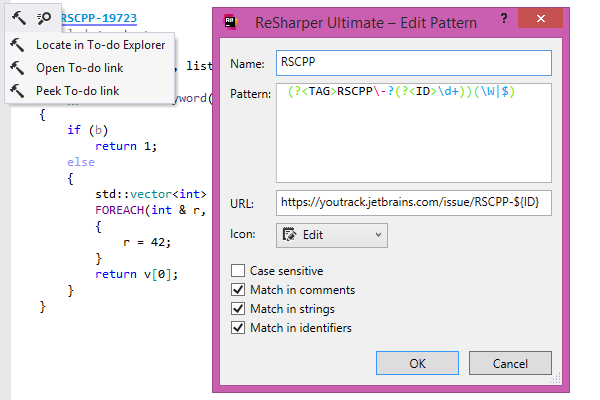 To learn more, see Code Cleanup with the ReSharper Command Line Tools. New inspection (with a corresponding fix and a code cleanup item) that suggests replacing if statements with if constexpr statements when the condition is a compile-time constant expression. A set of inspections to diagnose usages of deleted functions. Control flow and usage checking inspections have been updated to work inside lambda bodies. In ReSharper С++ 2018.1, .editorconfig files can now be used to set inspection severities for any scope: the entire solution, a project, or even a specific file. Besides this, inspection severity settings can be read from the project’s DotSettings file. It means that different projects can have different sets of enabled/disabled inspections or different inspection severities. Check the Read settings from EditorConfig and project settings option on the Code Inspection | Settings | General options page to enable this feature. To learn more, see Configuring inspection severities with EditorConfig. Bundled Clang-Tidy has been updated to version 6.0, which brings several new checks. A new inspection action lets you disable a specific Clang-Tidy check in the current line by its name. When the Clang-Tidy executable crashes, no system error dialogs will be shown from now on. If you select an expression and open the Quick Documentation window, it will show various information about the selected expression, such as its type, value, and value category. The new Tools | Unit Testing | C++ Tests | Use command-line arguments … setting controls whether ReSharper C++ should use the value of the Debugging | Local Windows Debugger | Command Arguments project property when running unit tests. Performance of the completion pop-up has been improved. ReSharper С++ 2017.3 brings the debugger into the editor: local variables, function parameters, current line expressions and function return values are now displayed inline right next to the corresponding code. In addition, ReSharper C++ comes with the new Go to Breakpoint action (Ctrl+Alt+F9) and the R# Breakpoints tool window for quick navigation between breakpoints in the solution, as well as the ability to create breakpoints and tracepoints from the Find Results tool window. 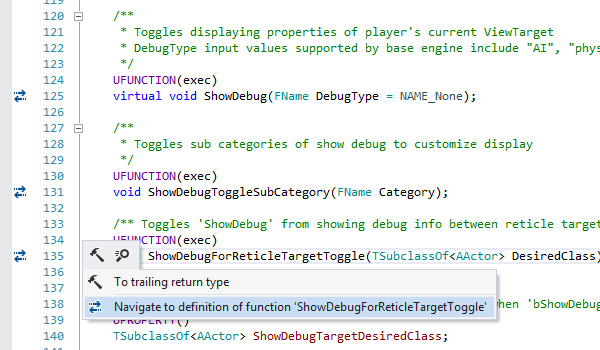 ReSharper C++ also provides its own debugger DataTips with the ability to search inside them for a specific value. 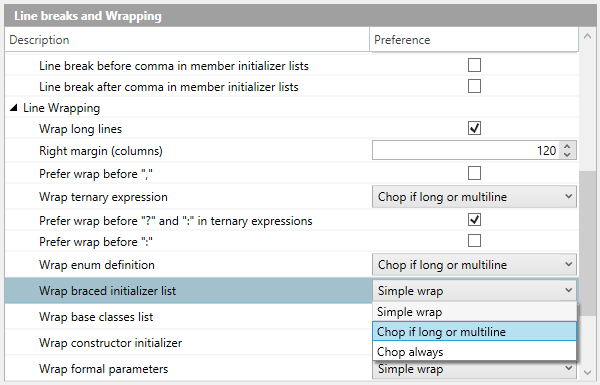 To access ReSharper DataTips, click the inline value display or replace Visual Studio DataTips in the Tools | Debugger ReSharper options page. Clang-Tidy is a powerful open-source code analysis tool, based on the popular clang compiler. It comes with the extensive set of code checks and accompanying fixes. ReSharper C++ 2017.3 provides seamless integration with Clang-Tidy, meaning that it simply works in the background as you edit your code, with inspection results shown on-the-fly in the code editor along with built-in inspections. ReSharper C++ also lets you apply the fixes provided by Clang-Tidy individually, as scope actions, or from Code Cleanup. In addition to the diagnostics from Clang-Tidy checks, Clang-Tidy also issues diagnostics from the Clang Static Analyzer and warnings provided by the clang compiler itself. All of them have corresponding ReSharper inspections with configurable severity levels, which can be tuned according to your needs. Please note that files using UTF-16 or UTF-32 encoding are not supported by Clang-Tidy at the moment. Deduction of return type for auto functions without trailing return type from C++14. Type checking and return type deduction for lambda expressions, including support for C++14 generic lambdas. Support for include_alias pragma directives. Improved handling of explicit template instantiations. Support for the event handling Microsoft C++ extension. Binary operator with identical or equal arguments. Redefinition of a default function argument from another declaration or a base function. 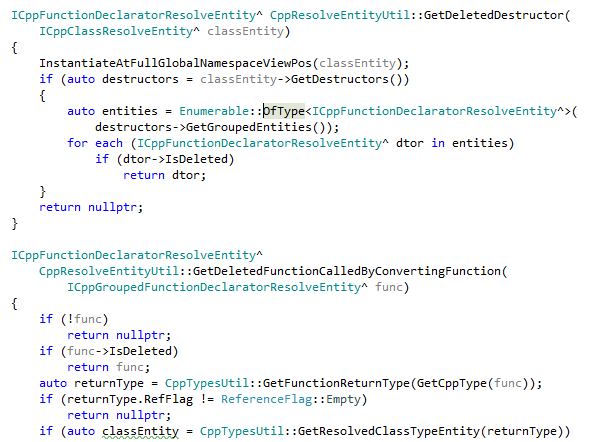 Redundant const specifier on a parameter in a function declaration. Missing function parameter description in a documentation comment. Redundant member initializer in a member initializer list. Non-inline variable definition in a header file. User-defined literal suffix that does not start with an underscore. Detailed diagnostics about errors in structured binding declarations. Convert a member initializer in a member initializer list into a non-static data member initializer. Switch between class and typename keywords in a type template parameter declaration. Aligning code in columns for assignments, declarations, and single-line comments. Outdenting commas and member access operators in chained method calls. Spaces before/after commas in uniform initialization braces and before end of line comments. The Go to Declaration command is now available on dependent names inside definitions of templates. Since ReSharper C++ has no means to find the exact entity that the name refers to, instead all symbols with matching names and signatures will be found and offered as potential navigation targets. Furthermore, Go to Declaration now lets you navigate from a function definition to a declaration with a non-matching signature, if no matching declarations are found. ReSharper Performance Guide collects a set of Visual Studio and ReSharper settings that might affect overall performance in one place and provides a way to quickly change them. 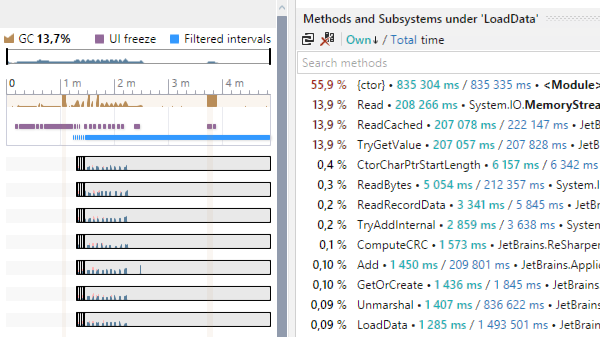 The Performance Guide page can be found in ReSharper options, under Environment | Performance Guide. 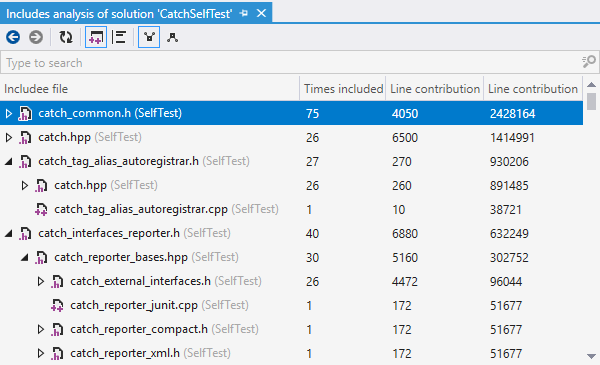 Catch2, the latest version of the popular Catch unit testing framework, is supported. To-do items support linking to external resources. Redesigned preview pane in ReSharper tool windows and formatter options pages. Find Usages window supports multi-line occurrences. Search Everywhere always shows text matches, even when there are other results. ReSharper C++ 2017.2 understands C++11 extended friend declarations and finalizes support for string and floating-point user-defined literals. The ongoing work on C++17 support is also progressing: selection statements with initializer, using in attribute namespaces, and capturing *this by value are all supported now. In addition, code inspections now take C++17 [[nodiscard]] and [[maybe_unused]] attributes into account. In an ongoing effort to improve performance, ReSharper C++ 2017.2 focuses on switching build configurations — by default, this operation now does not require reindexing of project files. 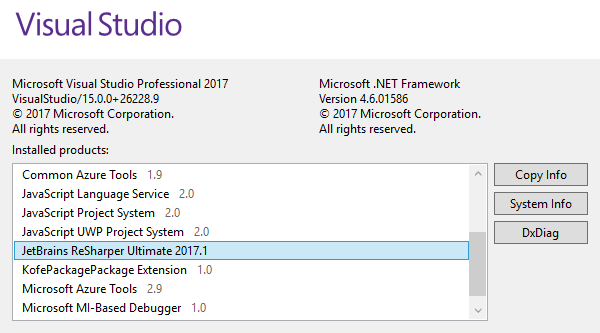 In addition, Visual Studio's Lightweight Solution Load mode is supported for C++ projects starting with Visual Studio 2017 15.3. This reduces UI lags caused by reading project properties and improves memory usage. Find usages and Rename can handle user-defined literals. Declaration search works inside bodies of macro definitions. Anonymous nested structures are supported in C code. Expression SFINAE support gets better. Completion lists inside class bodies include virtual methods from base classes that can be overridden. ClangFormat configuration files are supported and get automatically used as a source of formatting style settings. Long lines can be optionally wrapped, with a number of new settings for the wrapping behavior. Indentation of parentheses in function declarations, method calls and if/while/for statements. Inconsistent Naming detects violations of naming rules in your code. Additionally, the Naming Style options page was updated to allow adding custom naming rules, which let you configure this inspection. Local variable may be const highlights local variables that can be made immutable. Unused entity inspections extend their scope from local variables and function parameters to also include global variables/classes/enums that have internal linkage or are members of an anonymous namespace. A number of new quick-fixes for existing inspections were also introduced, including Add std::move when cannot bind rvalue reference to lvalue, Return unused expression, and Add an #ifndef/#define/#endif include guard. Navigate to file nearby displays project structure around the current file. Go to Text is integrated into Search Everywhere. Go to Everything searches now return results even when word order inside a CamelCased identifier is incorrect. Exact search supports adding quotes and using wildcards inside quotes to enforce a more precise match. Completing the work started in the 2016.3 release, ReSharper C++ improves compatibility with the latest Visual Studio release. It supports Open Folder and CMake projects, as well as the Faster Project Load Visual Studio setting. The set of postfix templates is extended with beg..end, new, var, const_cast, dynamic_cast, reinterpret_cast, static_cast, make_shared, and make_unique. You can configure the availability of C++ postfix templates and some other settings on a Postfix templates page of the ReSharper options.